Note: Mailing List Subscribe and Unsubscribe not currently working. Welcome To The Official KLAATU Home Page! Klaatu's Sir Army Suit Remaster Available For Purchase! Please visit klaatutheband.com to order the newly remastered Sir Army Suit CD. 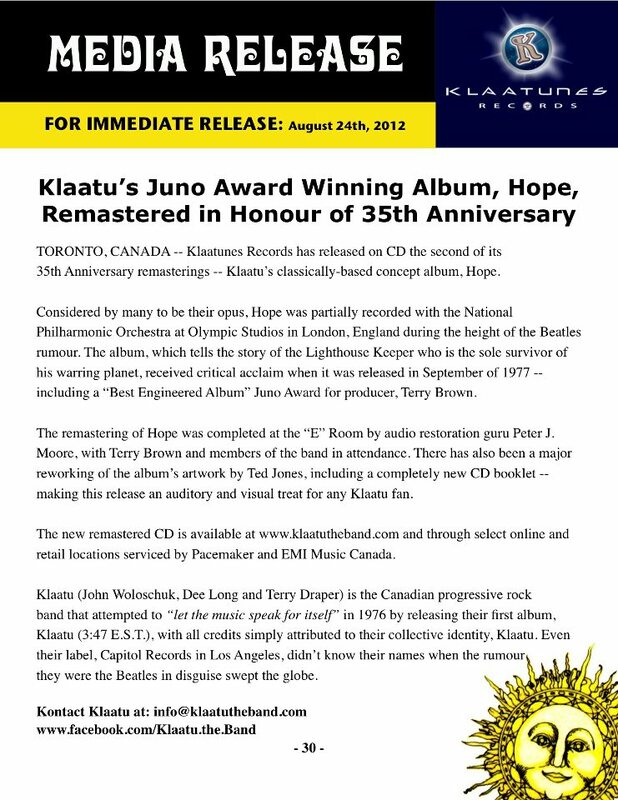 Klaatu's Hope Remaster Available For Purchase! Please visit klaatutheband.com to order the newly remastered Hope CD. 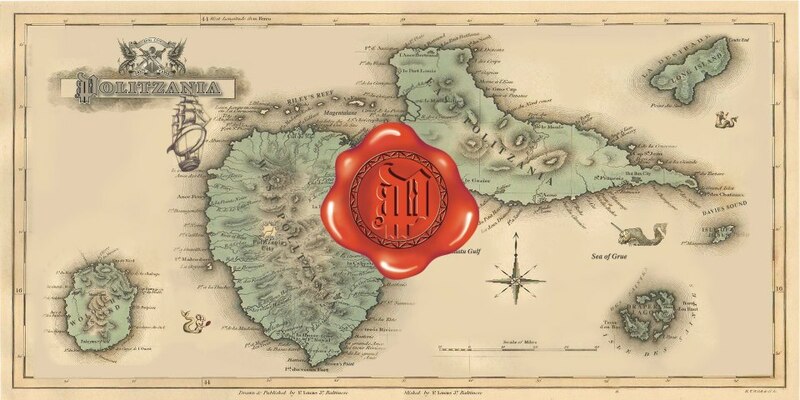 Click Here to see a map of Politzania from the new remastered CD's booklet! Klaatu's 3:47 EST Remaster Available For Purchase! 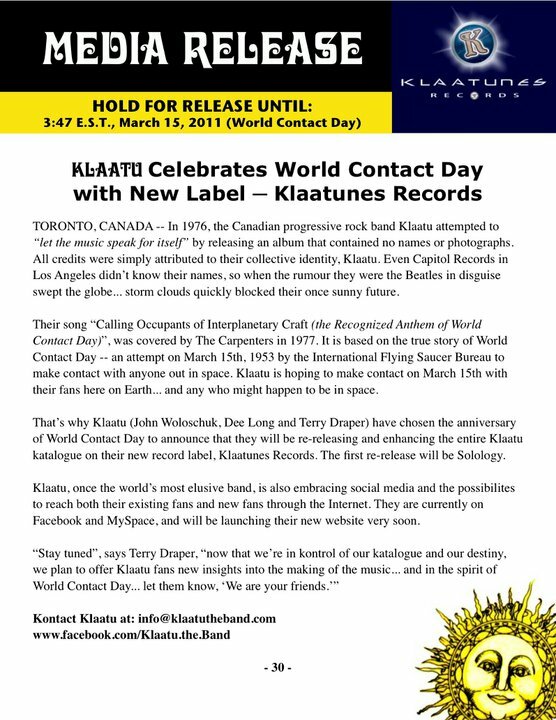 TORONTO, CANADA -- Klaatunes Records, the newly established indie record label for the band Klaatu, is pleased to announce that a new remastered release of their first album, Klaatu (3:47 E.S.T.) is now available on CD. The remastering, marking the 35th anniversary of the album, was completed at The ‘E’ Room with audio restoration guru Peter J. Moore at the helm. Also in attendance were members of the band, plus the man who knows Klaatu’s music best, their original producer, Terry Brown. "It was a magical experience," says Terry Draper, Klaatu’s drummer who has taken on the lead role in establishing Klaatunes Records. "Now that we are in control of the Klaatu katalogue we intend to revitalize our presence and offer our new and future fans the ultimate listening experience... and this remastering is an exciting first step." Peter J. Moore’s credits include Neil Young, Joni Mitchell, James Taylor, Oscar Peterson, Diana Krall, Neko Case, Bruce Cockburn, Murray MacLauchlan, Finger Eleven, Sloan, and hundreds of others. He’s won three Grammy Awards, two Genie’s, two Gemini’s and been nominated twice for a Juno. Klaatu (John Woloschuk, Dee Long and Terry Draper) is the Canadian progressive rock band that attempted to "let the music speak for itself" in 1976 by releasing Klaatu (3:47 E.S.T.) with all credits simply attributed to their collective identity, Klaatu. Even their label, Capitol Records in Los Angeles, didn’t know their names when the rumour they were the Beatles in disguise swept the globe. Click Here to review a review of the new CD release. Klaatu remasters are still happening! There have been people contacting me recently about the upcoming Klaatu remasters being cancelled. I'd like to set the record straight. A certain mastering engineer had expressed interest in doing the remasters. There were logistical issues involved in his participation in the project which proved to be insurmountable and as a result, he will not be doing the remastering. This does NOT mean that it won't be happening! It just means that HE will not be the person doing the work. This particular mastering engineer has publicly posted that the remasters are "Not happening, sorry." I'd like to point out that this individual is wrong on this point. His involvement with the project appears to not be happening. The project itself is still happening. Dee Long - 'Life AfterLife' - available now. Artwork ©2011, ALL RIGHTS RESERVED. 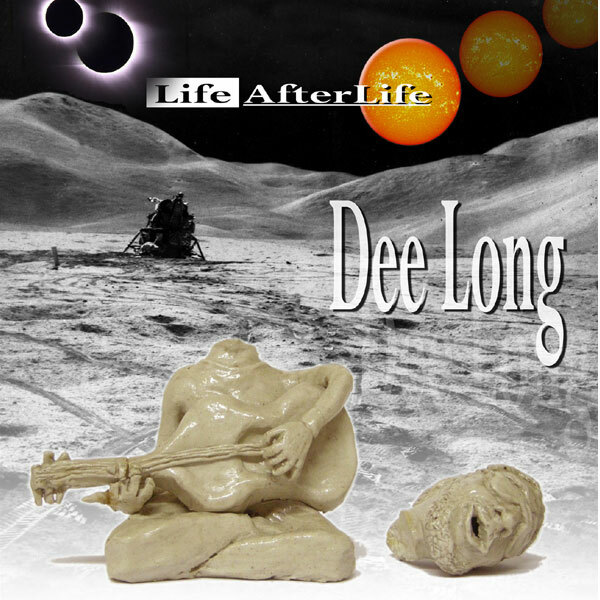 Dee Long's latest album, "Life AfterLife" is now available at DeeLong.com. You can buy the physical CD for $18 (CDN), $20 (US), $24 (INTL). Downloads are also available. See Dee's site for more information. I downloaded Life After Life yesterday and I am in awe at how good it is. With Life AfterLife, Dee continues his penchant for CD titles that can be plays on words. In this case, it's life AFTER life and Life/Afterlife! The recordings on this disc are all new recordings of songs Dee has written over the past 40 years. He's remade "Toronto", a song he wrote and recorded with Bloodstone in the early 70s, some songs he had demoed both before and with Klaatu, some songs he recorded and released with Klaatu, and some post Klaatu songs. He's chosen a beautiful selection of 18 tracks and does EVERYTHING on all the tracks except the drumming and drum recording/producing on "Little Neutrino". The sound is fantastic, the performance even better. Dee has layered lush harmonies and beautiful arrangements to make this one of the best CDs he's released yet, and that's saying a lot! Sometimes Dee has stayed faithful to the original, other times he's updated the arrangements/style of a track. In all cases he's pulled off some beautiful remakes. Note, while you may know some or even all of the song titles, this disc does NOT contain previously released recordings, only new recordings of these songs. Terry Draper - 'Stranded' - available now. Artwork ©2010, ALL RIGHTS RESERVED. Terry Draper's latest album, "Stranded" is now available at TerryDraper.com. You can buy the physical cd for $14.99 or download all 15 tracks as MP3's for just $9.99. And Terry is now on Facebook too. The title track, "Stranded" is outstanding! Very Klaatu-like. It could be a sequel to "We're Off You Know". "The Pirates of Port Royal" is a helluva lot of fun. Comparisons to "Sir Bodsworth" will no doubt abound. Terry Draper is back with a new release in January of 2011. "Stranded"
His voice is more like his mid-80s demos and the more finished recordings of those demos that appeared on 1997's Light Years Later. It's obvious that Terry has been working to make his voice one of his strongest assets on his recordings. "Call The People" could be compared to Strawberry Fields Forever. "The Young Girl"... what a beautiful melody that will stick in your head! Terry has several friends helping out with this release, including a couple of guest vocalists and musicians (including Klaatu's John Woloschuk on piano on one track!) 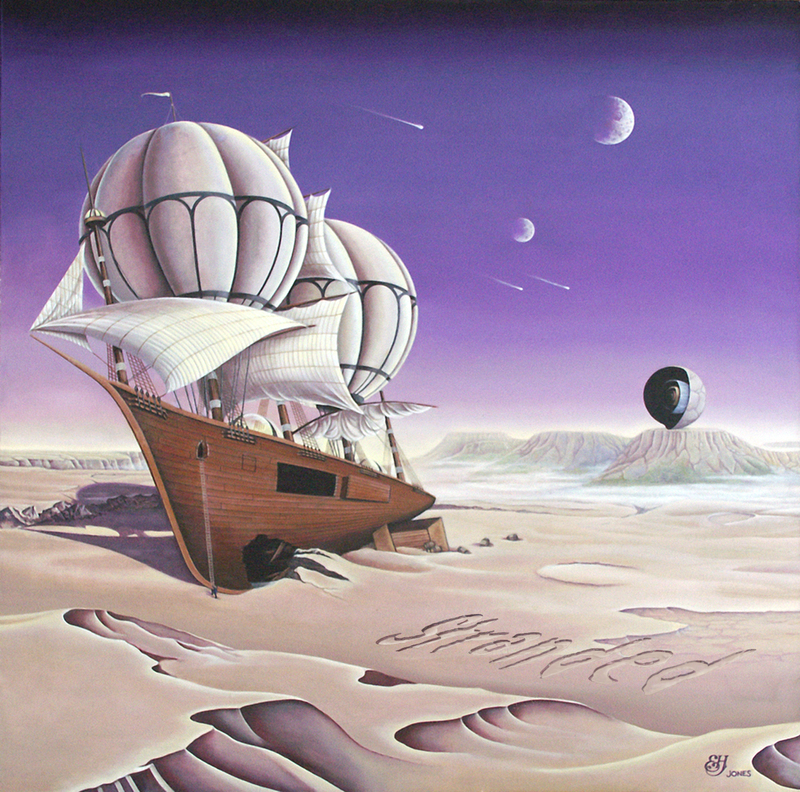 and the artwork is another great painting from Ted Jones (who did 3:47 EST, Hope, Engandered Species, Magentalane, SunSet, Raarities) and the booklet has a great layout with interesting artwork surrounding the lyrics. Great interview with Dee available! scroll down to the button that says "Launch Player" and click it. Player opens in new window. Scroll down to find "A Space In Time Dee Long Interview", click it, sit back and relax and enjoy a phenomenal interview with Dee Long! Thanks to Larry Wilson for allowing us to link to his interview! What's new with Klaatu? Click here to find out! 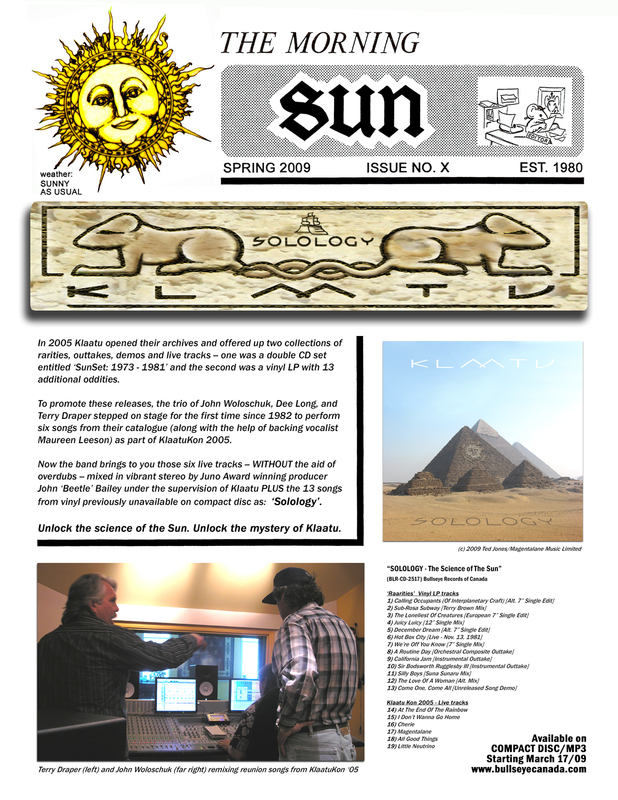 What's new on the Klaatu Home Page? Click here to find out! (p) 1996-2011 by Dave Bradley, klaatu.org, all rights reserved. All original content found in these pages is © 1995, 1996,1997, 1998, 1999, 2000, 2001, 2002, 2003, 2004, 2005, 2006, 2007, 2008, 2009, 2010, 2011 by David Bradley. Any non-original material found in these pages is © the respective copyright holder / date and is used by permission of the copyright holder. Permission is not granted for the use or copying of this material in any form, format, or media.